Last week I was able to take a quick trip to Disneyland with my girlfriend to share in the magic of what Walt Disney wanted his audience to experience 60 years ago. The beauty of this trip was two-fold. First, the trip coincided with Disneyland’s 60th Diamond Anniversary which meant the fireworks show was going to be extra awesome. It also just so happened to fall on the cusp of when Disneyland gets a temporary makeover with pumpkins, skeletons, and villains. Last time I went, the Haunted Mansion was being redone for Halloween, so I was fortunate to get a chance to see it this time around. I was giddy to check it out after hearing so much about it. This was our view for most of the drive. 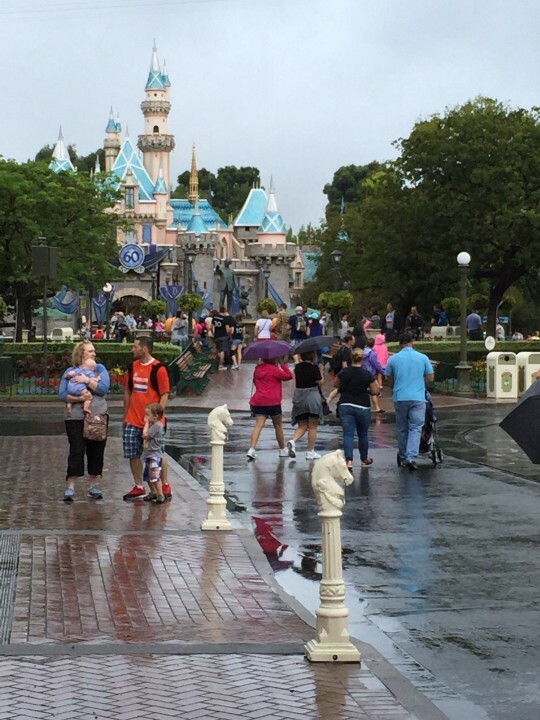 The day started off rainy, which is highly unusual for Southern California. (think drought.) But after experiencing multiple days of 100+ temperatures and stifling humidity, the rain was somewhat welcomed, although could have held off a day after we drove out there. We made sure to leave early as the traffic is unruly without it, so we knew it’d be even uglier than usual. We were thinking a quick trip to Starbucks would be in order, but after seeing the traffic, we quickly nixed that idea. So after a long, grueling 3 hours, we finally made our way to the most magical place on Earth. Our first glimpse of Halloween at Disneyland. Even exiting the highway, you know you’re going to be in for an unforgettable treat. The manicured lawns. The feeling that everything is exactly in its rightful place. Attention to detail. As the rain continued to pour down, we made our way to the parking structure. We waited for the trolley as park workers were busy shuffling people as fast as possible. It seemed nobody cared about the rain though, as a ton of people stood in line. With part of the park out due to the rain wreaking havoc on the electrical system, we decided to play it by ear. The one thing we both wanted to make sure we visited was the Haunted Mansion. While everyone else seemed to be flocking to the Small World attraction, we headed the opposite way to see if the Haunted Mansion had been shut down from the storm. To our delight, not only was the Haunted Mansion up and running, but the line was virtually non-existent. It was adorned with scarecrows, pumpkins, and cobwebs, although the cobwebs may have been there before. Jack Skelington took over the Mansion. In 1958 Disney himself cited plans to make a haunted house on the Disneyland grounds where guests could walk through rooms and gardens filled with spooky things. Of course being Disney, he didn’t want a run-down shack on his pristine park so he got a few different artists to begin sketching layouts that could make it happen. “We’re putting in wall-to-wall cobwebs. We guarantee you creaky doors and creaky floors,” Disney told audiences in a broadcast. He approached Ken Anderson, an imagineer, to design a walk-through attraction. A blueprint was done with highlights from the ghost from Fantasia, The Lonesome Ghosts from the Mickey Mouse short, and the infamous headless horseman. The real mystique of this attraction is that construction began, but didn’t open for another six years. As with everything Disney, the speculation was incredible on what went on behind those closed doors. Some said Walt himself lived there, and that’s why they didn’t want people to visit the site. Some said the attraction opened for a short time, but so many people had to check into the hospital afterwards from the shock value that they went back to the drawing board. The sad fact was Walt didn’t live long enough to witness the opening of the Haunted Mansion, with his death occurring three years prior. During the New York’s Worlds Fair in 1964, the omnimover was unveiled, showing a nonstop chain of rider vehicles that continuously move around. The designers realized they could use it to its full potential by not only keeping the foot traffic moving at a great pace, but also showing their audience exactly what they needed to when necessary. They could spin them around when they wanted to surprise you. They could build individual speakers in each cart to hear the sound creepily, clearly, and a sort of personalized way. Clashing ideas pulled the attraction in both directions. The two collaborators, Claude Coats and Mark Davis, had just finished designing the Pirates of the Caribbean attraction. Each having a different angle on what the Haunted Mansion should be about. Coats felt is should be frightening, giving the audience the sense of the more you scare them, the more they’ll like it approach, while Davis felt it should maintain the Disney theme and have a fun and lighthearted sense about it. They settled on using elements of both aspects, leaning more towards the latter. The original blueprint for the Haunted Mansion was based on a New Orleans antebellum manse, elements of the Winchester Mansion in San Jose, and the Shipley-Lydecker house in Baltimore. The opening of the attraction was met with polarizing reactions. Some people wanted it to be scarier, while others wanted the ride to go longer. Either way, it remains one of the most visited parts of the park, receiving thousands of people a day. Someone even decided to go so far as building a scaled version to live in. The beautiful thing about the Haunted Mansion is that the outside facade is not the attraction, instead there’s an elevator that lowers you into the “basement” where your journey begins. It stretches beyond the confines of the park, immersing you into a vivid, realistic environment. The audio animations used for the grim grinning ghosts and the paintings are great for selling the illusion. With the decorations enhanced for Halloween, it truly made it that much more fun. Some creepy artwork for purchase inspired by the attraction. The ballroom dancers are NOT holograms. They are actually an older technology called Pepper’s Ghost. It’s accomplished using a mirror reflection angled vertical to the viewer, and the effective use of lighting. The pipe organ that’s used is the same one from the film 20,000 Leagues Under the Sea. As of May 9, 2015 The HatBox Ghost is back in the attraction! He was originally a fixture when the Haunted Mansion first opened in 1969. 4. This one is unconfirmed but several sources have stated this. If you ask a cast member for one, while guiding you into the foyer of the Haunted Mansion, they will ask you to come back to the front afterwards — where there will be a “death certificate” waiting for you. That is the ultimate Disney souvenir in my opinion! I discovered this after the trip, so it was a moot point. A creepy clown under the duress of labor laws. Next we checked off the other must-do’s on the trip. Indiana Jones. Check. Continue my fascination with all things Coca-Cola. Check. Some things interesting that I never knew existed – the first one was in Great Moments With Mr. Lincoln. In the same building, there is a museumconnected to it that displays Disney’s sketches, blueprints, and layouts for his original vision of Disneyland. Even if you find this kind of thing boring, it’s seriously worth checking out. When the park opened in 1955, Disney built it exactly as he envisioned it. A really great piece of history was also present in the room. The original bench that Disney sat on in Griffith Park where he took his daughters to ride the carousel, coming up with the idea where parents and children could enjoy the same place together. For a complete and in depth viewing of Disney’s life story, I highly recommend PBS’s American Experience: Walt Disney. The spark that ignited Disneyland was imagined on this bench. After that we wandered over to this really crazy medieval place where you could find your last name in the book of surnames. The name is escaping me, but my love for the medieval time period made me run around like a 2 year old. The knight’s armour, the shields and crests, and finding your last name is what makes this place worth exploring. As the day came to a spectacular ending, the rain had cleared up, the humidity lowered, and all eyes were on the fireworks display over Sleeping Beauty’s Castle, decorated in blue diamonds and indigo banners. The show went on for a good 15 minutes of lights, animation, and of course tons of pyrotechnics. It was truly an incredible experience with the added bonus of Disneyland celebrating their 60th anniversary. I can’t wait to go back.